Permanent makeup, also known as also known as intradermal pigmentation or permanent cosmetics is a great way to enhance your beauty. The art, also known as micropigmentation or cosmetic tattooing, uses a specialized tattoo device to implant cosmetic pigments in the shallow top layers of the skin. The implanted designs from can look like lip liner, eyeliner, or lipstick, which is considered cosmetic. Cosmetic permanent makeup provides the longest lasting results in the industry. Bella Reina Spa provides the most natural-looking cosmetic and restorative micropigmentation. The team, led by renown artist Denise, provides permanent eyeliner, eyebrows, and lips. Denise’s over 35 years has made her eyebrows legendary because of the her ultra-fine hair-line strokes. Careful measurements are made and colors are meticulously blended to complement features and skin tone. Minimal down-time and easy after care make this method very popular. Scroll down to the bottom of the page for more before and after pictures. Who is Permanent Makeup Good For? Corrective touch ups to prior permanent makeup. Corrective work is probably one of the biggest requests we receive. Examples include uneven brows, cheap ink that has faded or brows that the color did not hold. Most commonly known as cosmetic tattoos, permanent makeup got it’s start in beauty salons in the 1930’s. It uses a technique that uses implanted pigment that is placed into the shallow top layers of the skin. This cosmetic procedure allows the artist to create permanent makeup, the ultimate in ready-to-go makeup. Permanent makeup is a revolutionary method of applying natural pigments into the dermal layer of skin. This state-of-the-art technique is medically proven and considered completely safe. It is used for a variety of cosmetic enhancements such as permanent eyebrows, eye liner and lip liner. 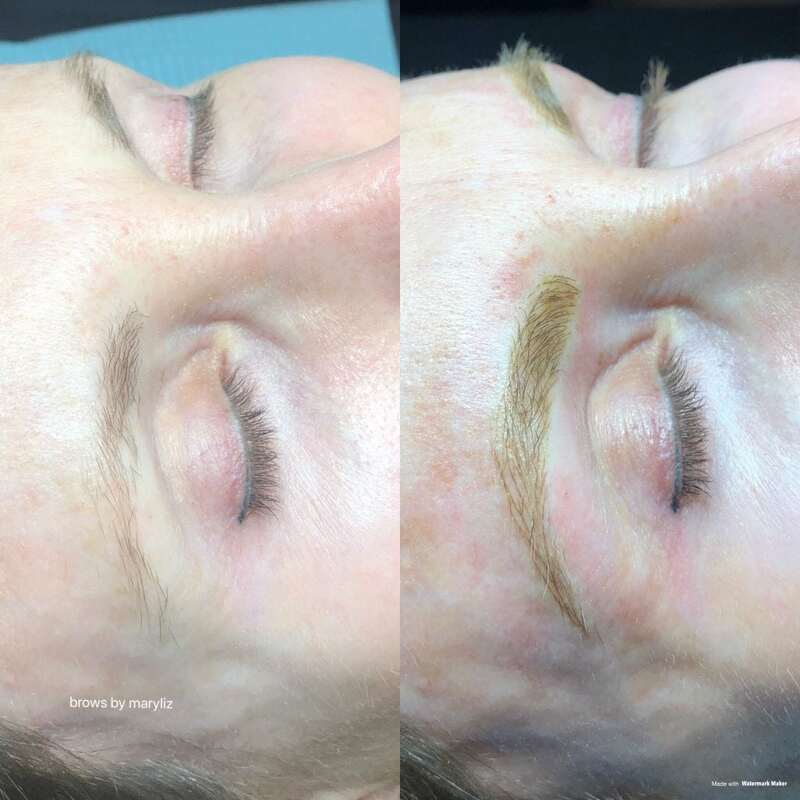 For more on Microblading, please see this page and the gallery. Corrective Brow…………… Prices based upon consultation. This is the most natural looking result and great for daytime. A traditional tattoo device is used to add tiny dots of color between the lashes to enhance and define the eyes. A wide range of colors are available for a customized look. A thicker band of pigment is used to dramatically accentuate the eyes. A slight upturn (or ‘wing’) is added at the outer corner to visually lift the look of the eye. A wide range of colors are available for a customized look. Downtime is usually 24 to 48 hours and aftercare is simple. * A Bella Girl word of Caution: Bargain hunting for dresses or shoes is a really great thing. Bargain hunting for your face will cost you 5 times as much in the end. The cost and time for fixing corrective work far outweighs having it done right the first time. Permanent makeup and 3D Eyebrows are available at three locations for your convenience. Other locations available closer to Fort Lauderdale and Miami upon request.